Eating out in London, whilst one of my favourite past times, can be quite expensive and I therefore reguarly take advantage of pre-theatre menu offers, voucher deals and fantastic schemes such as the Tastecard. I was however pleasantly surprised when I discovered Brasserie Zédel as an affordable restaurant in the middle of the West End where, not only is the food good, but you get to enjoy it in beautiful surroundings. 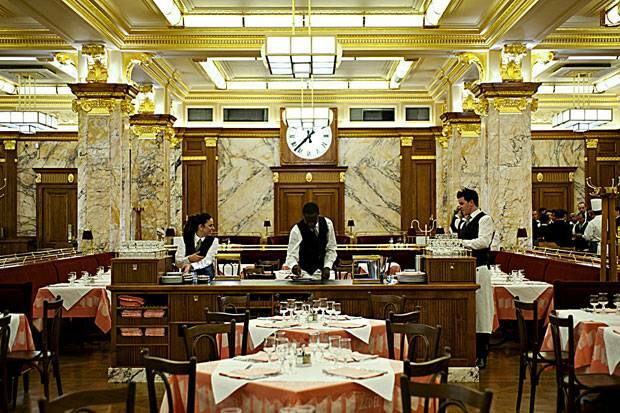 When I first entered the dining room at Brasserie Zédel I was overwhelmed at the decor. The large space is exquisitely finished with art deco styling, giving an air of luxury. Don’t think this means there is a stuffy atmosphere though, the bustling room full of chatty diners and friendly staff keeps the atmosphere laid back and casual. I’d feel as comfortable going in there in my jeans to grab a quick bite to eat with friends as I would done up in a posh frock for a special occasion. When seated we were handed a French menu, but the waiter happily exchanged this for an English version. The menu is large and varied, full of French classics, I’d be surprised if you can’t find something on there to tickle your taste buds. 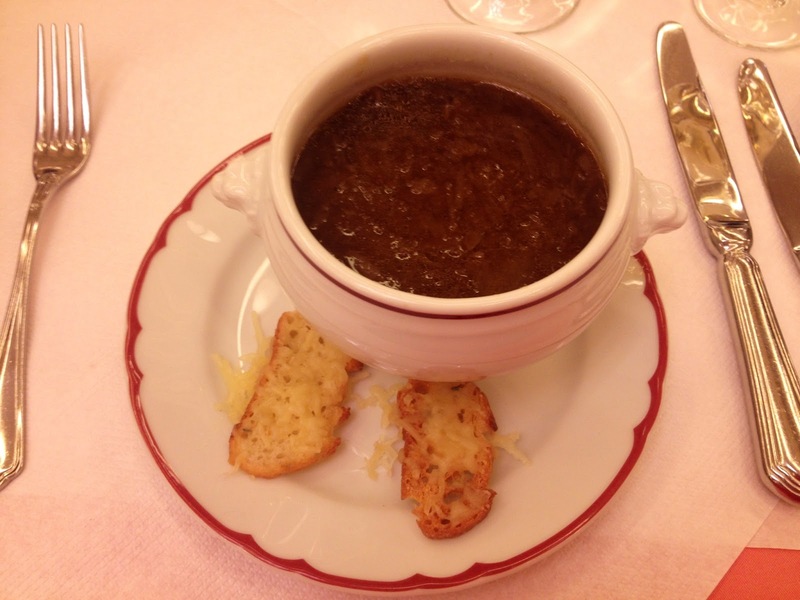 I opted for the classic French onion soup to start which was extremely tasty, but pretty much as expected. You can’t really go wrong with a French onion soup and I really enjoyed this. I’d have preferred a larger crouton and to have had it already soaked in the soup, but these were also nice, I dropped them in so they still soaked up all the liquid. I’ve also eaten the mushroom medley as a starter here before which is a really surprising but very tasty dish, its served up cold which is a bit confusing as it’s not what you’d expect, however I still think the flavours were great. I went for another French classic, the beef bourguignon for my main course which was beautifully cooked, the meat was really delicate and falling apart beautifully. I’m not going to lie, its not the best I’ve ever had, but I’ve paid a lot more for it elsewhere. For the price bracket at Brasserie Zédel, the food is really great. The mashed potato was smooth and creamy and perfect. No complaints whatsoever about this dish. A real hearty and tasty dinner. My friend ordered the Poulet au Champagne (chicken sautéed with pasta in a champagne sauce) which I am definitely ordering on my next visit because I tried a bit and it was delicious. We didn’t have dessert this time but I have had the crème brûlée before which was perfectly nice and I did try a bit of the tarte au citron that my sister ordered on one visit and that’s definitely on my ‘to try’ list alongside the chicken. Much to my delight the luxurious feel of this restaurant is not reflected on the bill! 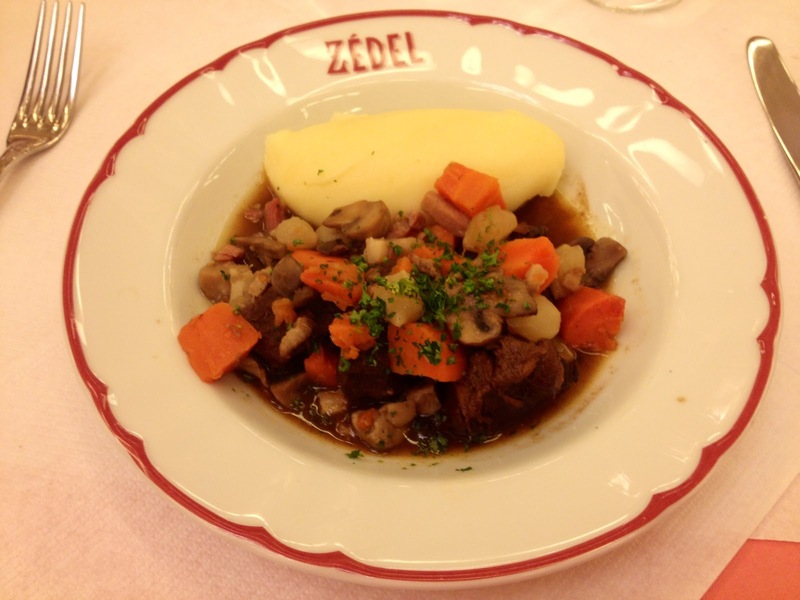 Brasserie Zédel is incredibly affordable for it’s high standards, especially when compared to other restaurants in the area. For it’s Piccadilly Circus location and for such a quality experience, this really is a bargain and I would strongly recommend it. I can’t wait for my next visit so I can have the Poulet au Champagne.